As you remodel and update your home, it can become costly very quickly. As homeowners ourselves, we understand how hard it is to keep your vision for your house in line with your budget. Take a look at some of our before and after photos to get ideas for your kitchen and get a layout of what you want it to look it. Make a plan. And stick to it. Have a vision of what you want, and don’t get caught up in things you know you don’t need or hadn’t thought of before. Working with one of our designers can help you not make expensive errors that are easy to avoid. Decide on what you want. Everything. This helps budget out your costs and keeps you on track with the budget as well as the time. Picking as you go leads to changing minds, which can add costs to the contractors and make sure everything is done on time. See if your cabinets can be updated instead of being replaced. 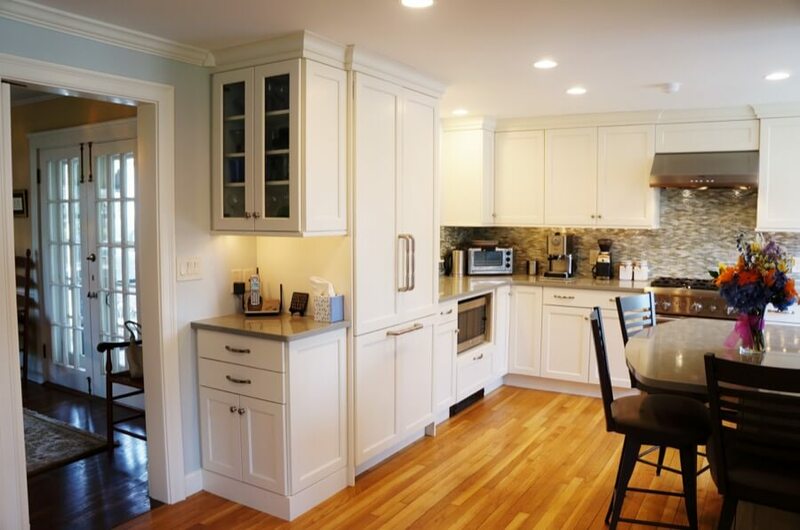 Cabinets are one of the most expensive pieces of the kitchen remodel. Assess if there is something you can do to make them look updated, like restain them or repaint them, can give them a whole new look. Use open shelving as opposed to a fitted cabinet. This may mean you have to style your plates a little nicer, but it can save a lot of money because you aren’t paying for more wood and labor. Pick and choose the “extras” like the backsplash. Is this something that is necessary that you can’t imagine your kitchen without? If it is, then add it, if you can live without it, there’s a cost that is cut immediately. Add lights. This isn’t a costly addition, but the lights will make your kitchen brighter and give it a newer look and feel. It will also make a big impact on your kitchen without making a big impact on your wallet. Keep plumbing alone. Moving the sink, or pipes are a costly replacement. If there is a way to structure your kitchen the way you want while keeping everything where it is, then it could save your thousands and not to mention headaches if everything doesn’t go as planned. Increase efficiency, not the size of the kitchen. This will help use every inch of space you have, making sure you add stacking abilities to the cabinets rather than having standing spaces. Keeping in mind all of these things, plus working with a designer to ensure everything is followed and thought about before the process can save you thousands of dollars. If you want to visit our showroom and see all the options for your new kitchen. Still have questions about your kitchen remodel? We also understand that remodelling your kitchen is a big decision, check out our reviews to see what our customers are saying about us. And contact us with any kitchen question, and we are happy to help!